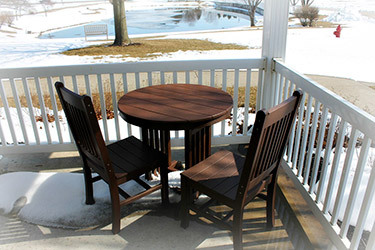 Arriving in Shipshewana, a town of just over 650 people, one immediately notices the overall calmness and serenity floating over vast acres of fields, fenced house estates and pastures. Shipshewana is one of Indiana’s Amish communities. 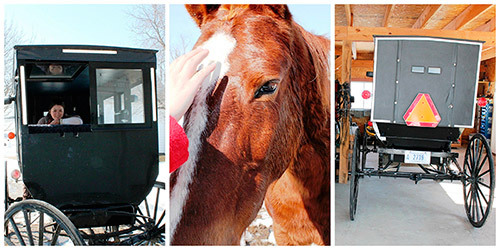 Horse-drawn carriages, known as ‘buggies’, and bicycles are the Amish means of transportation. Everything is so peaceful and still, that it almost felt even like our bus started slowing down to a glide with the life’s gentle pace in Shipshewana. 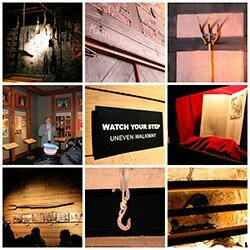 Through interactive exhibits, multimedia and displays of historic events, we learned about the Amish people and their history, their plain lifestyle without modern conveniences (such as electricity! 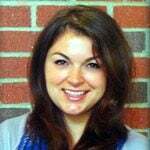 ), their faith and their community. It was interesting to learn that the Amish are trilingual. They speak a dialect of German called “Pennsylvania Dutch” or “Deitsch” when speaking among themselves and with other Amish. They learn English at school and speak it to anyone who is not of the Amish faith. In addition, they offered to speak to our tour group in Spanish! 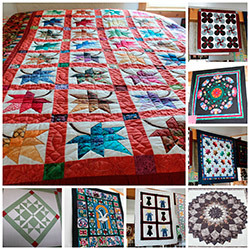 Quilting is part of the Amish tradition. All the designs are unique and quilted by hand, with prices ranging up to thousands of dollars for a single blanket. The quality is unparalleled. As a passionate cheese connoisseur, I went into this store with much enthusiasm. And boy was I not disappointed! 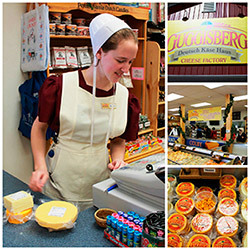 Guggisberg Deutsch Käse Haus is an Amish cheese factory, home of several World Cheese Championship winners: Premium Swiss, Baby Swiss, Colby, Colby & Monterey Jack, Marble – to name only a few. However, after indulging in the various samples throughout this factory, I think I picked my favourite: all of them! The option to buy cheese on the spot ensured I brought a few packages home for continuous enjoyment. Excitement tends to wear you out. So when the group started opening snacks and looking at their bags of cheese dreamily, our guide knew it was time for supper. Let me just say here that when I say supper I actually mean lunch. For the Amish people, that is the last meal of the day due to going to bed early and rising early, hence the term ‘supper’ for a 3:00pm meal. But delightful food is delightful. A friendly warning before I move on: reading the following part will make you hungry! Our hosts started us off with freshly baked bread, butter from their farm, and home-made peanut butter and apple sauce. Although unusual for most of us, it was definitely refreshing starting a meal with what could be considered dessert. However, this did not spoil anyone’s appetite. On the contrary! 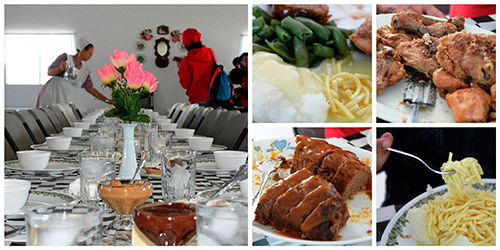 Dining plates started getting a little tight while we were passing along the long table trays of meat, sauces, chicken, steamed vegetables, mashed potatoes, gravy, and noodles! Everything was fresh, taken from their farm or garden, and completely homemade! And despite the urge to be hasty when surrounded by all this food, I really tried to my best to honour the Amish spirit of simple humility and eat my supper as slowly as possible, basking in the aroma, the taste, the texture, the sight and the flavours. One of the 1000 things to do before you die! 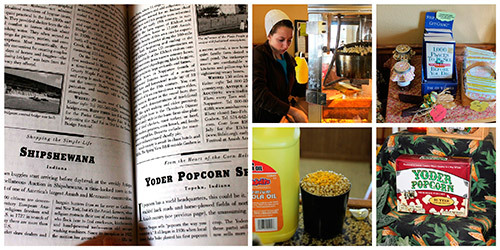 A special treat and a milestone life experience was visiting Yoder Popcorn. Upon entering, the staff hands out a bag of free freshly-popped popcorn with butter to each visitor. Yummy! But the delicious popcorn is only one part: this small popcorn shop is officially among the “1000 Places To See Before You Die”, which makes me think that I should maybe start working on ticking off this list anyway, now when I have one down. Coming from my busy and sometimes hectic daily life, It was refreshing to be indulged in this slower lifestyle, made even more memorable by the friendliness and hospitality of the Amish people I met during the trip. There is so much more I want to show you, but it would have been disrespectful taking photos of people who never agreed to it. And if being an international student in a foreign country has taught me something it is to always be mindful and respectful of the culture.